WCIU, The U | LondonHouse vs. Aire: How do Chicago's hottest new rooftops stack up? LondonHouse vs. Aire: How do Chicago's hottest new rooftops stack up? Summertime calls for drinks in the sky, and there are more options than ever with a handful of flashy new openings this season. We know your time is precious, so we’re checking them out to determine what’s worth the trip. 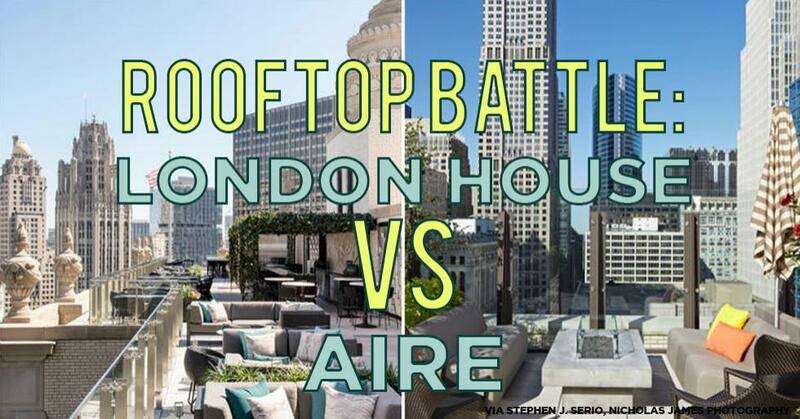 Up first: Aire at Hyatt Centric The Loop Chicago vs. LH Rooftop at LondonHouse. The cherry on top of the 24th floor of Hyatt Centric The Loop Chicago, this 5,000-square-foot open-air rooftop deck opened in May and offers 360-degree views of surrounding Loop buildings. The 3,500-square-foot outdoor terrace you can’t stop hearing about sits on the 22nd floor of the historic Loop building recently renovated into a hotel and offers sweeping views of Michigan Avenue, Wacker Drive, the Chicago River and Lake Michigan. The tri-level experience also includes an indoor bar on 21 and a private cupola on 23. Click here to see who wins this battle.